After your order is placed, email us your info via Amazon's email system or we will send you the information form through Amazon's email system. It typically takes 24-48 hours to complete your order and ship it once your information is received. Your choice a set of 2 large credit-card sized tags OR 3 small tags plus one large card. Image & text are imprinted into the surface of the plastic cards (sublimated) - won't delaminate over time! 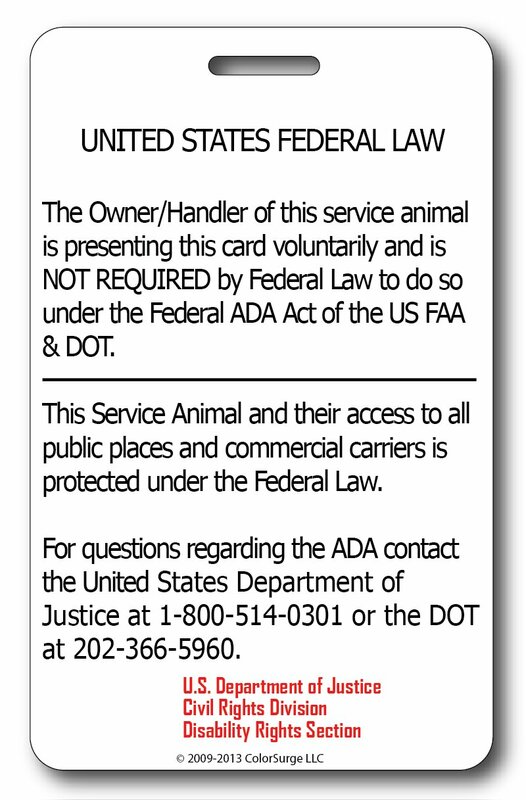 A Service Animal ID Card helps to identify your animal as a working service animal and not a pet. Federal law does NOT require you have service dog ID card. But if you do have a service dog you know that many out there are not knowledgeable about the ADA laws with respect to service dogs, and taking your dog with you can be hassle as a result. At the store, or the post office or even in the airport, having your animal's ID prominently displayed on his collar is an inexpensive way to help keep your day flowing smoothly. 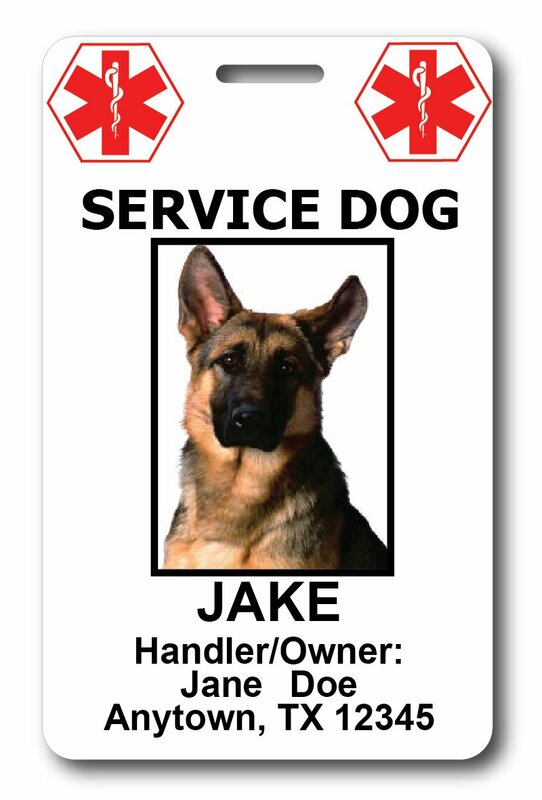 Service Dog ID cards are an optional way of identifying your service animal to members of the public, just like service dog patches or vests. Tags have some advantages over vests - they are lightweight and don't require the dog to wear a vest that can be hot. They also can be easily taken off and stored when not needed. Service Animal ID Cards can accommodate any size dog. The Large animal set consists of 2 large plastic credit-card sized tags. The Small animal set is three small tags plus one large tag. You will have the opportunity to specify your animal's size when you order. Once we receive your order, we will email you a simple form for you to fill in and and return to us with your dog's photo. Typically it takes 1-2 business days to complete your order once we receive your completed form and dog's photo. The Service Animal ID Cards will have a full color picture in order to identify your working animal, so a clear picture of your animal will be needed. If you need information on what type of picture would work best, simply contact us and we'll be happy to assist you. By completing this purchase, you are affirming that your dog meets the requirements of a service dog and that the dog has been specifically trained to mitigate the disability of its owner. Misusing these ID cards is illegal and punishable by law.